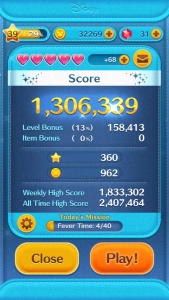 I won’t say I’m the best player because there are definitely players that have way higher scores than me, but here are some pointers for how to achieve higher tsum tsum scores. sometimes you want to go fast, but going fast means that you over-think and over-analyze. let the fingers do the work and let your mind handle the calculations. don’t try to go fast, just go. when clearing a bunch of tsums, look for the next sequence, attempt to predict where they will fall. many times the starting point of where you start the chain affects how good the chain is. as the happiness boxes are only 10k, you should buy them until you have filled the first 8 characters (Mickey, Minnie, Donald, Daisy, Goofy, Pluto, Chip, Dale). the reason we do this is to gain latent points. 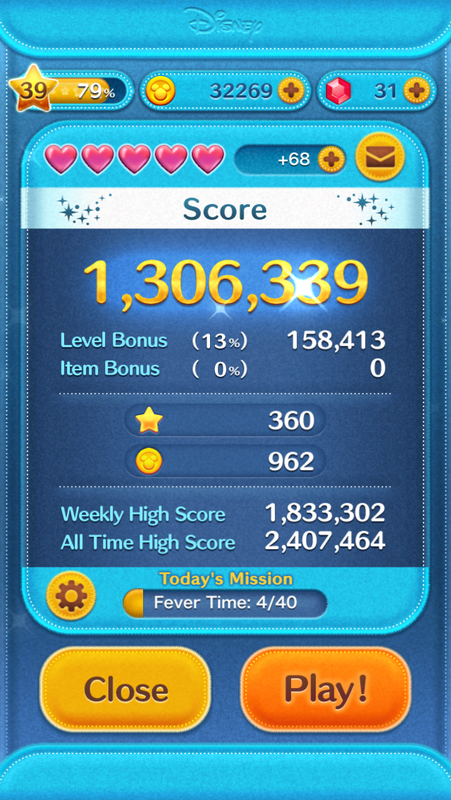 everytime you play, 5 different tsums are used, the more tsums that you own, the higher the point value, and as you play, they keep gaining levels/points even though they are not your main tsum. once you have gotten the first 8 characters, start buying only premium boxes at 30k, try not to use the coins for anything else, other than boxes. the +score gives an extra 10% and the 5>4 makes it so there is higher likelihood of getting some nice chains. take a look at all the tsums, in all of them under the level, they will have a score. this is their default base score. obviously the higher the level the higher the points, but the points only increase linearly. 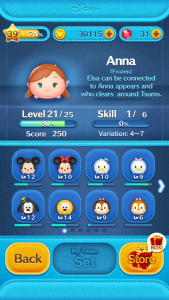 so find a tsum that has a high base value, it will make getting points faster. if their score at level 10 is less than 100, they are probably not worth playing. some others that are not that great is Maleficent. she has a high base value, but her strategy basically means that when its skill time, you will have to have lined up some nice massive chains, and even then the skill is so short that you only have enough time to pull off 1 or 2 chains. 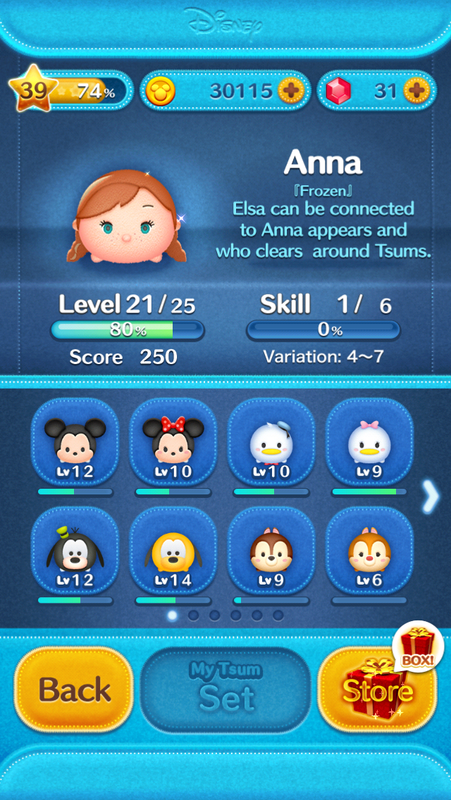 as you have chosen a tsum with a high base value, clear your main tsum first, as they will always be there and will be more plentiful. this will guarantee a better score, as well as get that skill in faster.